My main character name is Honey. 6. 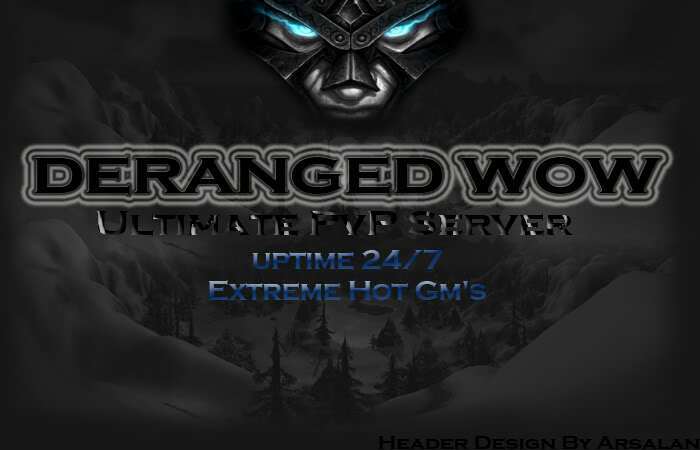 How long have you played on Deranged-WoW? I go start playing today. Every day i can spend 5-6 hours.Weekends 7-8 hours. 8. Have you ever been banned for any reason? If so, why? Give the name of the person who banned you. 9. How much time each day do you spend on the forums and/or in-game? on forums i will spend 2 hours.Ingame i will spend 5-6 hours. 11. Have you had previous experience as a Game Master? If so, how long and what server? I am basically a simple , adjusting and funloving person, whom others consider as sincere and friendly too.I am a person who is positive about every aspect of life. 13. Explain why you think you would be an excellent Deranged-WoW GM. Because i'm friendly.I respect rules.I love GM job. Helping other players.Be friendly.Respect Rules. I will be helpfull.I dont do any possitive addions yet. Well,i'm from Serbia,i dont know english excellent. 18. What do you think is the most important thing a GM can do ? I believe the main duty of a GM is to read tickets, follow instructions from higher staff ranks(this includes ALL admin, the head GM(s), server Owners, and sometimes even helping out other GMs), do events to keep the players involved in the server, respecting players and ALL staff members(even if you don't like them or they're really obnoxious), take care of any problems players are having, and to take care of spammers/advertisers and hackers using .ban all <Name>. 19. If you were fired, what would your reaction be? 20. The following is a situation that may arise while on our staff. What would your reaction be? "GM! This guy is speed hacking! Ban him plx!" Okey,i will watching him.Thank you for report him.Enjoy. 21. The following is another situation that may arise while on our staff. What would your reaction be. I will report to owner/admin. 22. If you are accepted, what would be the very first thing you would do once set up with your powers? I will answer on tickets. 23. You Know Anything About : Mysql Or Database / Heidisql Or Navicat Errors? , If Yess? What Kind Of Error ? I was have my own private server..i know for errors when i wanna import SQL Files into Navicat or heaidsql. 24. You Know Anything About Mangos / Trinity Commands? , Server Core : Mangos, So You Should Know, If Yess? Write Down 5 Examples.